Power Take-Offs (PTOs) are designed to fit all internal combustion engines with standard SAE flywheel housing dimensions from No. 6 through No. 0. The clutches range in size from one plate 6″ to three plate 14″. Suitable power take-offs are available for use with engines in industrial installations up to 583 horsepower. 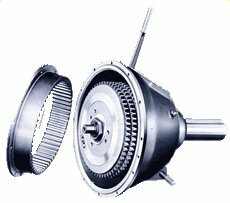 A Power Take-Off consists of a complete clutch assembly with shaft and bearings mounted in a cast iron housing that provides for easy engine installation. PTO’s are used as a standard method for transmitting the power of engines in a great variety of industrial applications such as: air compressors, agricultural machinery, pump drives, crushers, road building machinery, cranes and shovels, oilfield service, etc. Woodbridge Equipment offers most popular brands of power take-offs for all industrial engines with sealed pilot bearings to eliminate the lubrication requirement and shaft rifle-drilling normally encountered with standard pilot bearings.